We wait all year to have this meal in my family. 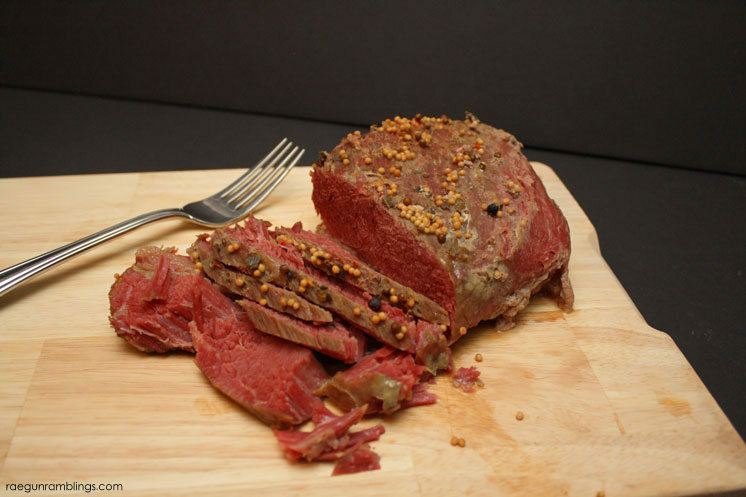 Ever since I was a little girl we would celebrate St. Patrick’s Day with Corned Beef and I LOOOOVED it. I would wear my giant green pin that said “A Wee Bit Irish” and look forward to Corned Beef and Cabbage and green lemonade for dinner. We still get together for this treat every year. 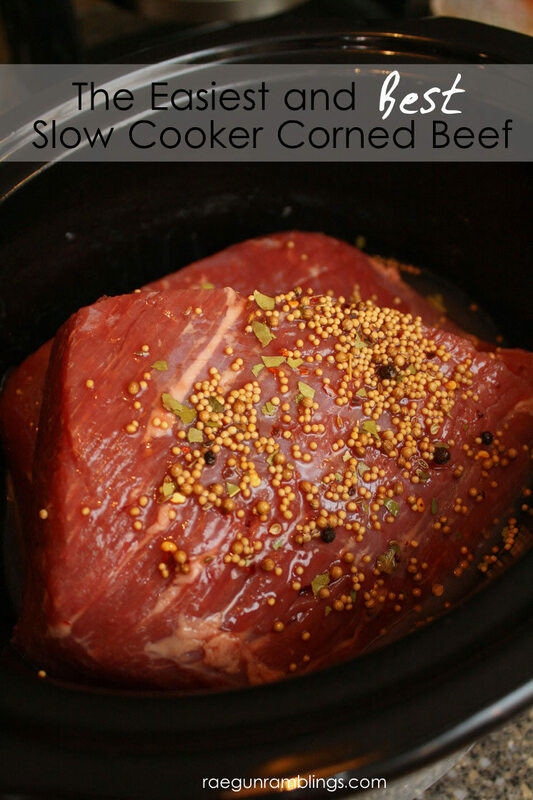 Growing up I never knew it could be so easy to make corned beef but today I’m sharing the absolute easiest recipe for corned beef that you can make right in your crock pot. And if you want you can can even cook the potatoes and cabbage right there with it but I personally like to do those separate. 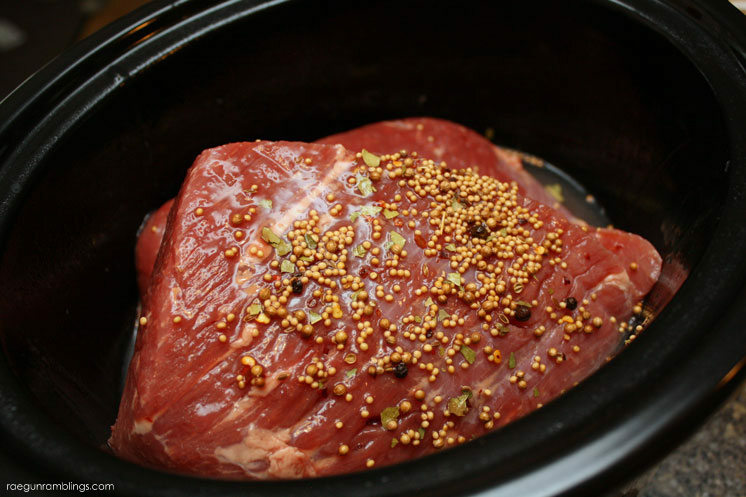 Place the corned beef in your crock pot. Top with the seasoning pack that comes with the corned beef. Pour 1 and 1/2 cups of water into the packaging the corned beef was in to get the last bits of flavor that stuck and pour that on top of your the beef. Cook on high for 4-5 hours or low for 6-8 hours. So easy right? Now if you also want cabbage you can just throw it on top during the last hour of cooking or what I prefer to do is boil the cabbage with a big ladle or two of the cooking juices from the corned beef. Want other great recipes for the crock pot? 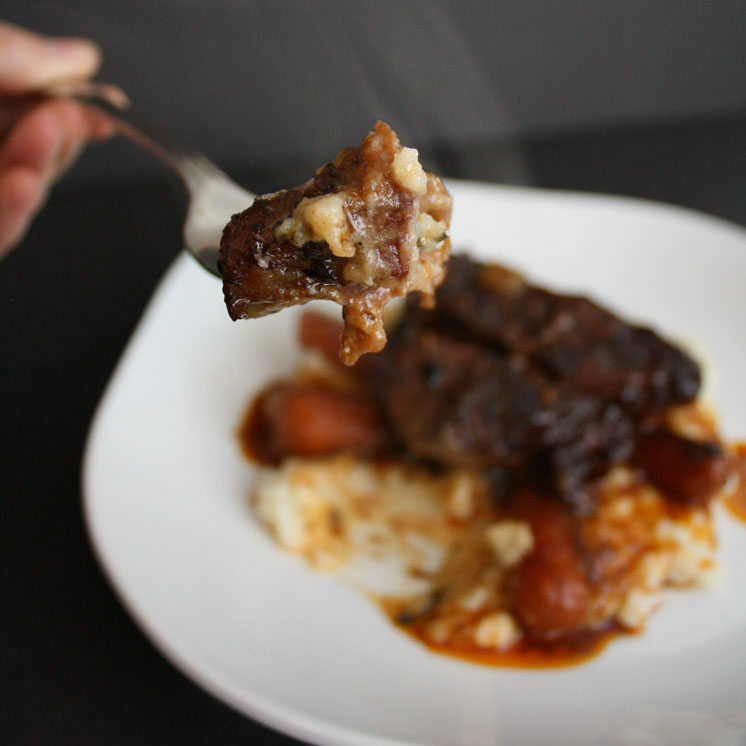 Check out this delicious Fancy Beef recipe for the slow cooker. 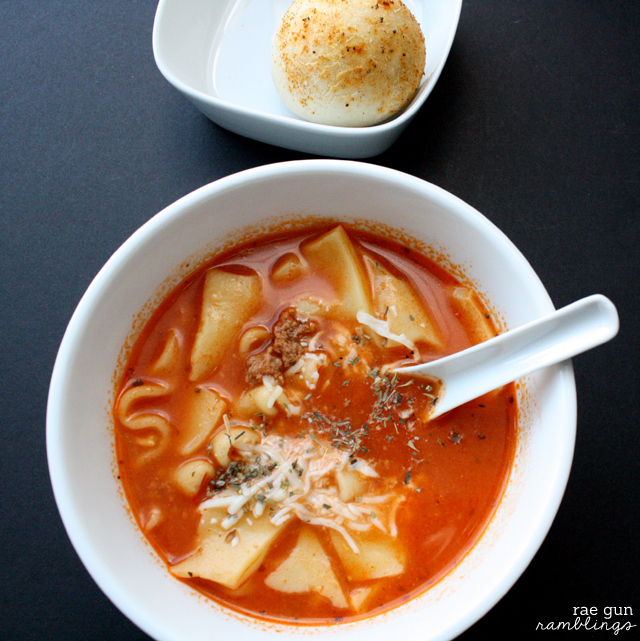 And don’t forget my crazy easy and scrumptious crock pot Lasagna Soup recipe. 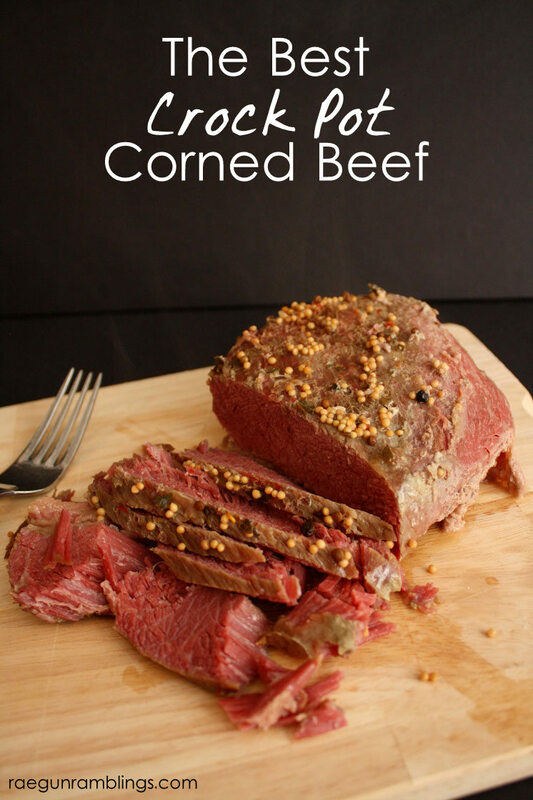 Yum, we love corned beef around here, too! Have you ever tried cooking it in apple juice? Someone gave me that tip in a checkout line one year and I decided to go ahead and try it. It was delicious! I LOVE doing my corned beef in the crockpot! I actually mix a little brown sugar with the water and pour that over the corned beef along with about 12oz. of beer (like Guinness). Sometimes I spread a little mustard over the top of the corned beef as well to add a little more flavor. Delish! SO simple. I usually make a mustard and brown sugar glaze to put on our corned beef but i don’t think I’ve ever tried to cook it in the crock pot! yes now you can make as much as you want to your hearts content! I use a can of beer instead of water. Have been doing it this way for probably 35 years. Wouldn^t do it any other way. Thanks for the tip I’ll have to try that! My husband is obsessed with corn beef and I had no idea where to start to make this at home instead of in the can. Glad you shared this! Thanks for linking up with delicious dishes recipe party! Yum. I am trying this. However, it was hard to see your post, there were SO many adds that is had to restart the page a few times. Thanks for the feedback. I’ll have to look into that! Sometimes you just need the easy instructions and not a fancy recipe. Thank you!! Love this recipe! So easy. However, I use beef broth instead of water. Make a richer taste.